Black and white slogan badge. 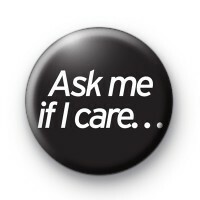 This sassy black badge has the text 'Ask me if I care' written in a bold white font. It is for everyone that is fed up with listening to other peoples wows. So wear this so people know that you just don't want to hear them going on & on. We love a good slogan pin badge & have quite a few funny ones in the shop.